Mutual Fund Investments on the Decline in 2016..
India's benchmark share indices have surged almost by 7.5% since the beginning of 2016. And there is a good amount of feel good factor prevailing. But, trends on equity mutual fund side paint a different picture. As reported in Business Standard investment in equity mutual funds has been going down since the beginning of 2016. The chart below clearly highlights this trend. An article in Mint reports that about 2 dozen private equity players are looking out to raise US$ 200 cr to be invested in Indian equities. 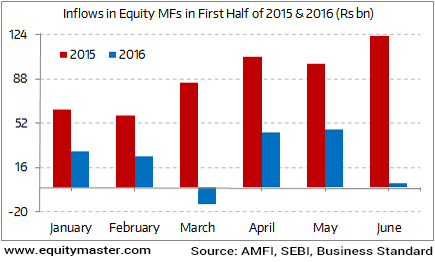 So the quantum of new FII money coming into Indian equities may again far outstrip the domestic investment. Now this has typically been the case across market cycles. Domestic investors in India are typically late entrants and miss out on the earnings surge and uptick in valuations. In fact they fail to notice the long term trends and miss the analytics that the FIIs have access to.